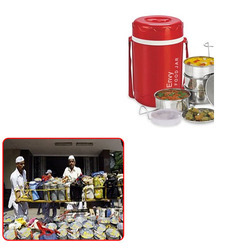 We are a leading Exporter of tiffin carriers for tiffin service from Vasai, India. Our organization is well-known in the market as a reliable manufacturer, supplier and exporter, engaged in offering Tiffin Carriers for Tiffin Service. Sturdy in design, these carriers are manufactured using quality-approved plastic, steel and other basic components that are sourced from the authentic vendors of the market. Offering these carriers in various colors and designs, we aim to attain huge client-base.